Can spring be far away, now that March is (almost) here? It depends on which weather-forecasting rodent you listen to, but I'm going with Octorara Orphie, who predicted an early spring. Remember to set your clocks ahead before 2 am on March 8 (assuming that they don't reset themselves, that is) or you'll miss some of the fun on Charter Day (some info listed below, watch for additional info next week). March 8: Charter Day —activities include a program of short WWII-era documentary films about anthracite coal and railroad industries (at 2 and 3 pm), the Pennsylvania Trail of History game, and the opening of a new changing exhibit, "We Can Do It: Women in World War II." Margo L. Azzarelli, author of Lackawanna County Chronicles, will be on hand to sign her book. Admission is free and visitors can enjoy a piece of Pennsylvania's birthday cake. Noon-5 pm. March 15: Lackawanna Audubon Society—Program is “Not Following in the Footsteps of Darwin: the Galapagos Islands,” with Mike Carey. 2:30 pm. March 8: Charter Day—Site will be open noon-4 pm. March 21-22: Ohio Country Conference— this annual program explores a variety of historical topics and includes an evening reception and discussion at Bushy Run (full conference program and registration info). March 8: Charter Day—the site’s largest living history event of the year, with British and French military units, Native American interpretation, folk art to view and buy, and loads of books. Noon-4 pm. March 22: Spring lecture—Jack Brubaker will present "Massacre of the Conestogas" at 2 pm. March 8: Charter Day—tours of the furnace are free today. Noon-4:30 pm. March 10: Friends Lecture Series—Bob Donely will talk about “Bethlehem Steel Mining Operations," exploring the local iron ore that was used in steel production. Lectures are held in Freeman Hall auditorium at Cornwall Manor. 7 pm. March 8: Charter Day Open House—music and dancing, open hearth cooking, storytelling, textile demonstrations, and much more. Noon-4 pm. March 22: Women’s History Lecture—Susan Speros, Marcia Houston, and Courtney Stevens will explore the socioeconomic dimensions of 18th-century dance and music in this interactive program (bring your dancing shoes). Light refreshments will be served. Suggested donation, $2; regular admission applies for guided and self-guided tours of the Boone House and historic area. 2 pm. March 29: Pennsylvania German Easter—children can explore the historic area as they hunt for Easter eggs (please bring a basket), use colonial dyeing methods to color their own Easter eggs, see blacksmithing and other demos, and learn about Pennsylvania German traditions. Admission is $4 for ages 3 and up; light refreshments will be served. March 8: Charter Day—museum is open free of charge today. UPDATE: Drake Well is collecting toiletries and household cleaning products for Titusville YWCA's St. James House (women and children's shelter). Noon-5 pm. March 19: Heritage Lecture Series—Mark Ritke will present a program on bluebirds. Admission charged. Doors open at 6:30 pm, lecture starts at 7. March 28: Something More Saturday—come celebrate Col. Edwin Drake’s 196th birthday by visiting the birthplace of the modern oil industry. Included in regular admission; special family rate of $20 for up to 2 adults and 3 children. 10 am-3 pm (sing happy birthday and have cake at noon). UPDATE: Eckley is currently closed due to a broken water main. The film program will be rescheduled. March 8: Charter Day film presentation—Greg Matkosky will present his film Up from the Mines, a 90-minute tv documentary produced for WVIA and including footage shot at Eckley. Site is open noon-4 pm for self-guided tours; the film presentation will begin at 2 pm. March 1: Museum Store reopens for the season. March 5, 12, 19, 26 (field trip): Winter History Class—class began in January, but you can still sign up for the remaining sessions or the field trip on March 26. March 8: Charter Day—demonstrators will share their skills, and the Ephrata Cloister Chorus will perform in the Saal (meeting house) at 2, 3, and 4 pm. Admission is free. Noon-5 pm. March 11: Storytime—designed for preschoolers and their adults, the program pairs a story with a related craft or activity. Cost is $6 for an adult and accompanying child (age 3-5), $3 for each additional child; FREE with family-level membership or Ephrata Public Library Museum Pass. 10-11 am. March 21: Making History Workshop—this month's installment in the series is "Fraktur." Learn how to make your own Fraktur inspired by the art of the 18th-century Ephrata community. Fee charged. 10 am-noon. March 27-28: Stuffed Animal Sleepover—preschoolers can leave a stuffed animal or doll to have an adventure at the site (adorable photos from last year), then return the next morning (with an adult) to take part in the same activities. Cost is $6 for an adult and one child (age 3-5), $3 for each additional child; FREE for family-level members or with Ephrata Public Library Museum Pass. Drop off is between 3 and 5 pm on 3/27; morning program on 3/28 runs 10 am-noon. March 8: Charter Day—the ship is still under winter cover, but it is visible and there’s plenty to see indoors. As a preview of the museum's upcoming traveling exhibit, "Plastic Waters: From the Great Lakes to the Oceans," opening in April, there will be family-friendly activities focused on recycling and how plastics affect the Great Lakes. Admission is free. Noon-4:45 pm. UPDATE: (How did I miss this?) Murder at the Maritime—this new event is offered in partnership with Mercyhurst University. Registration discounts for Flagship Niagara League members and Mercyhurst Alumni; includes cocktails and hors-d'oeuvres (so you must be 21 or over to attend). More details and registration info. OR this? March 30: Storytime at the Maritime—the last Monday of each month, the museum presents storytime with a special guest reader. Program is free. 10 am. March 8: Charter Day—be sure to take a free tour of the Keith House today or bring the kids for a coloring activity. Noon-4 pm. March 8: Charter Day—the Mansion will be open today free of charge. Noon-4 pm. March 8: Charter Day and Dr. Priestley’s Birthday—visit with costumed docents in each room (including the laboratory), watch the Spinners and Weavers Guild at work in the kitchen, and wish Dr. Priestley a happy birthday while he demonstrates the wonders of chemistry in the Pond Building. 1-4 pm (chem demos at 1:30 and 2:30). March 7, 14, 21: Folk Art & Friendship Classes—intro to papercutting (scherenschnitte), tole painting, and scratched eggs are the topics for this month’s classes hosted by the museum store (registration required, details on the website). 1-3 pm. March 4, 11: Homeschool classes—featured crafts and target age group vary (more information here). 9 am-noon. March 8: Exhibit opening—Charter Day is the launch point for a new temporary exhibit, “1865: Lancaster County at the Close of the Civil War,” which will be on view through December. Other Charter Day activities include craft demonstrations, horse-drawn wagon rides (weather permitting), and tours. Noon-5 pm. March 28: Heirloom Seed Project Grafting Workshop—for anyone who’s wanted to learn how to graft apple varieties, this program is it. For $30, you get instruction, hands-on practice, and scion and rootstock to take home with you. Registration is required by March 15; call 717/569-0401 x204. March 8: Charter Day—Admission is free today, noon-5 pm. UPDATE: March 11: Gardening Class—"Pruning: Now or Later?" will help you understand what you can prune now and what has to wait. Class is free, but space is limited. Call 724/266-4500 x 102 to RSVP. 7-8 pm. March 28: Easter Egg Hunt—children 5 and younger will hunt for eggs in the garden, while ages 6-12 explore the village. Baskets will be provided, and light refreshments will be served. Cost is $5 per person, and reservations are required as space is limited. March 8: Charter Day—craft demonstrators will be on hand and tours of the Manor House will be offered free of charge. Please bring a non-perishable food item for the Pennsbury food drive. 1-4 pm. March 15: Spring Fever—learn about spring tonics, allergy cures, and other 17th-century medicinal remedies. Included in regular admission. 1-4 pm. March 22: Beer and Bread Sunday—beer brewing and bread baking were closely related tasks in the the 17th century (think yeast!). The brewers will be making German March beer and the bakers will be turning out some tasty bread. Included in regular admission. 1-4 pm. March 29: Animals at Pennsbury—come meet some of Pennsbury's animal residents, who are as anxious for spring as the rest of us. Included in regular admission. 1-4 pm. March 3: Central PA Civil War Roundtable Series—Dr. John Quarstein will present a program entitled "Fall of Fort Fisher, NC: The Gibraltar of the Confederacy." Donation requested. 7 pm. UPDATE 3/4/15 - cancelled due to weather - March 4: Friends' Richard Koontz Memorial Lecture Series—Michael Bezilla's topic will be "Penn State's Participation in the Great War - World War One." Donation requested. 7:30 pm. March 7: Military Movie Madness Festival—PMM kicks off the 2015 museum season with a raft of short films from the US Army Signal Corps (details of what and when). Included in museum admission. 10 am-4 pm. March 8: Charter Day—the Museum will be open free of charge, noon-4 pm. March 21: Documentary Film—“You Enter Germany: Bloody Huertgen and the Siegfried Line,” a German documentary released in 2007 includes archival footage and interviews with veterans. Donations accepted. 1:30 pm. March 7: Read Across America Day—enjoy stories about trains, railroads, and amazing people, places, and things. Children will receive a passport stamp after each story as well as stickers to decorate a suitcase. All activities are included in regular admission, except for "Breakfast with the Conductor," which requires advance reservations (call 717/687-8628 x 3009 to see if spaces are still available. Museum open 9 am-5 pm (check here for story times). March 8: Charter Day—the museum is open free of charge from noon to 5 pm. 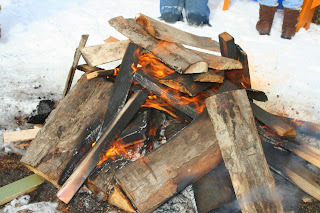 March 14-15: Sugar in the Mountains, Maple Taste and Tour—experience Somerset County’s maple history and visit the site’s 1860s sugar camp; includes tractor-drawn wagon rides. Event is free, donations accepted. 10 am-4 pm. March 28: Pysanky Egg Workshop—Jennifer Mudery, who demonstrates her craft at Mountain Craft Days, will teach this beginner course (I've taken it and she's a very patient teacher). You’ll end up with a nice starter kit and an egg to take home. $25 includes all materials ($20 for members). Call 814/445-6077 to register. March 6, 13, 20: Storytime in Curiosity Connection—the Winter Reading Series continues, combining books and play for children ages 3-5. Included in general admission. 10 am. March 8: Charter Day—the original 1681 Charter of Pennsylvania will be on display, and this year's "guest documents" relate to the construction of the State Museum and Archives Complex, which is 50 years old this year. Loads of other activities are on the schedule as well. Admission is free. Noon-5 pm. March 20: Learn@Lunchtime/3rd in the Burg—Brock Shelley from Commonwealth Connections will be on hand to talk about this year's "South Central PA Scholastic Arts" exhibit. Museum admission is free during the program. 11 am-1:30 pm. March 8: Charter Day—a variety of demonstrations are planned throughout the day: chocolate-making, blacksmithing, and Rev War military drills. Tours of the Lower Park and Thompson-Neely House will be offered and (weather permitting) Bowman’s Hill Tower will be open. Admission is free. 10 am-4 pm. ADDED: March 29: Lecture—Jim Stinson will present "From Hearth to Battlefield: A Look at 18th-century Arms in the Early Years of the American Revolution" (more details on Facebook). Lecture is free. Visitor Center Auditorium. 2 pm. Many Pennsylvania Trails of History sites carry the responsibility of preserving historic structures. The Erie Maritime Museum lives in an important Erie harborfront building, the former Pennsylvania Electric Company (Penelec) Front Street Generating Station (in operation from 1917 until 1991). The task of maintaining the building’s original machinery poses unique challenges, especially when we rely on those machines to be fully safe and operational. The Museum exhibits a General Electric steam turbine generator that only last year received an important update, the installation of carbon brushes [Linda wrote about the project in a previous guest post]. Similar carbon brushes are important to running the Museum’s 50-ton Cleveland Crane, which is used to lift cannon and other heavy artifacts. 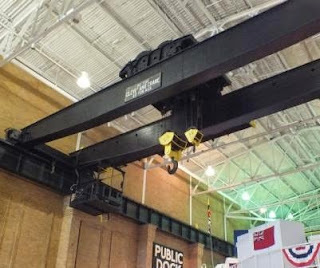 The crane is operated by direct current motors powered by a General Electric motor generator (MG) set located in the building’s basement. 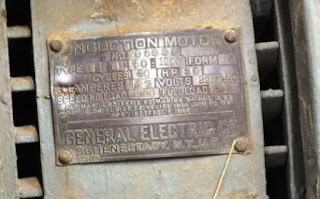 The early 20th-century MG set consists of a 50-horsepower alternating current induction motor driving a 35-kilowatt direct current generator. Current is conducted from the rotating parts of the generator and is transferred through a sliding electrical contact involving carbon brushes. Docent Rich Hall, a retired GE design engineer, recognized that these brushes will eventually wear down. He alerted Site Administrator Walter Rybka to the need to obtain replacement brushes now, while there are still people who have the expertise to make and install them. Patents on the motor parts range from 1893 to 1911, and specifications for the brushes were not readily available. If the brushes were allowed to wear out, the crane would stop working and the equipment could be damaged, requiring expensive repair. Rich’s colleagues Gary Lozowski (Morgan Advanced Materials application engineer, Greenville, SC) and Steve Dewitt (lab technician) were happy to have an opportunity to inspect the vintage machine and make the necessary measurements to manufacture the correct brushes. Morgan manufactured the parts and donated them to the Museum, as they had done for the earlier GE steam turbine project. On October 14, 2014, local GE motor engineer Walter Konstanty and Rich Hall installed the new, correct carbon brushes. As they removed the decades-old, worn brushes, they realized that some of them were not quite of the correct design. The new brushes needed to be sanded here and there to fit and to make smooth contact. 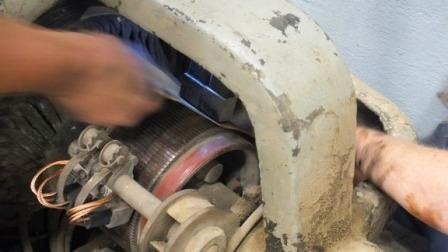 The brushes’ pressure against the commutator was also checked. 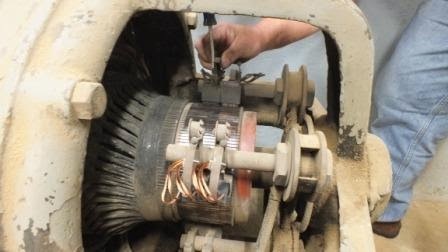 Studying the vintage motor generator set and replacing all brushes now has helped ensure the Erie Maritime Museum’s crane motor will run for years to come, keeping this vital piece of equipment operational. This week's post is a compilation of things as we plunge ahead into winter. We've been pretty fortunate here in southcentral Pennsylvania so far, but it's supposed to be reeeeeaaaallyy cold the next few days. So we'll start off with something to keep you warm. Most sites on the Trails of History will be closed on Monday, Feb. 16, for Presidents Day, but Fort Pitt Museum and the Railroad Museum of Pennsylvania will be open and waiting for your visit. Speaking of the Railroad Museum, in honor of the Museum's 40th birthday this year, staff are looking to borrow items from members of the public that serve as mementos or souvenirs of past visits. The items will be displayed during this anniversary year and then returned to their generous owners (more info based on the Museum press release). I attended the Winter History Class last week at Ephrata Cloister and heard a fascinating talk about the Amish (their religious roots and their contemporary lives) as well as a presentation on postcard views of Ephrata. I always enjoy the talks and the interesting discussion and questions from the class participants (a very knowledgeable, curious, and thoughtful group). While I was on site, I caught this photo of a hawk that landed on the fence as I was walking in from the parking lot. When you're having a bad day, just think about the poor squirrel in this photo. I hope you have a great weekend, stay warm, and (if you're celebrating) a happy Valentine's Day. There are many factors to take into consideration in storing textiles. The first question you need to ask is, “Is this clean?” (As we learned from Lauren’s “Freezing History” post, the Lumber Museum textiles have been freshly vacuumed.) 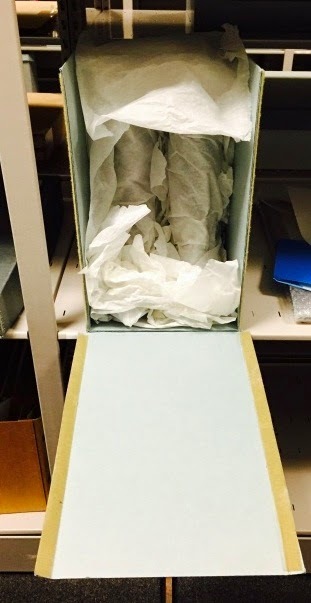 Next, determine what supplies you need to store your textiles effectively (check out this brief supply guide from Museum Textile Services). The two easiest ways to store textiles are to lay them flat or to roll them. You can also hang clothing/costumes on a padded hanger, but that can be tricky and is dependent on the type/condition of the textile. (The National Park Service has guidelines for storing clothing and costumes.) Regardless of which method you choose, the rule of thumb is: fold/crease as little as possible. Folding heavy or delicate fabrics can often be damaging, especially when they are stored for long periods of time. So for some textiles, such as heavy quilts or rugs, the safest bet would be rolling. The best way to roll a textile at home is to use a cardboard tube lined with uncoated polyester film sheets (such as Mylar® type D). 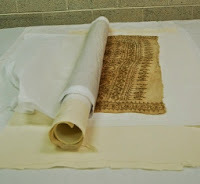 (Above and below) An example of a rolled textile from the State Museum of Pennsylvania. This is a linen shawl with sequins and a gold leaf paisley pattern c. 1820s. The textiles we froze and vacuumed from the Lumber Museum were mostly clothing and blankets, all made from an assortment of materials. There was everything from wool CCC uniforms to a silk pillowcase, leather mittens to cotton long underwear. For our purposes we felt that flat storage, by way of acid-free textile boxes, was the best method for the Lumber Museum’s textiles. Luckily, we were able to reuse some of our original acid-free boxes (which were frozen and cleaned) in addition to new acid-free textile boxes we had in stock. When we were packing the acid-free boxes it was important to remember to keep heavier textiles, such as a wool jacket, on the bottom of the boxes, and lighter textiles, like a cotton shirt, on the top. 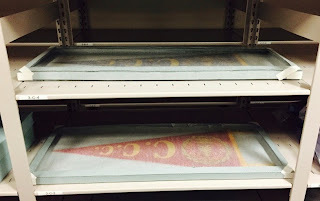 Unfortunately, while rehousing some of our Lumber Museum textiles, folding could not be avoided. In situations like this, where slight folding is unavoidable, it is important to pad the folds with acid-free tissue or washed unbleached muslin. By padding the folds, the pressure on that area of the textile is decreased. If you are folding a blanket try using an accordion fold that avoids any preexisting fold lines. It is also important to remember to refold the textile every so often so pressure isn’t on the same spot for years on end. 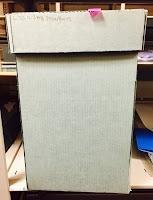 The final step in storing textiles, or any collection, is labeling the outside of the box. Though simple, and almost obvious, it’s amazing how important this step is. Once you are finished packing or rolling, be sure to label the box or tag the roll with a catalog number (if there is one) and object name. It is also helpful to do this on multiple sides—that way the chance of putting it back without the label facing out is slimmer. This helps avoid confusion in the future and protects the object from any unnecessary movement or unpacking. Our storage and rehousing journey did not end with labeling. 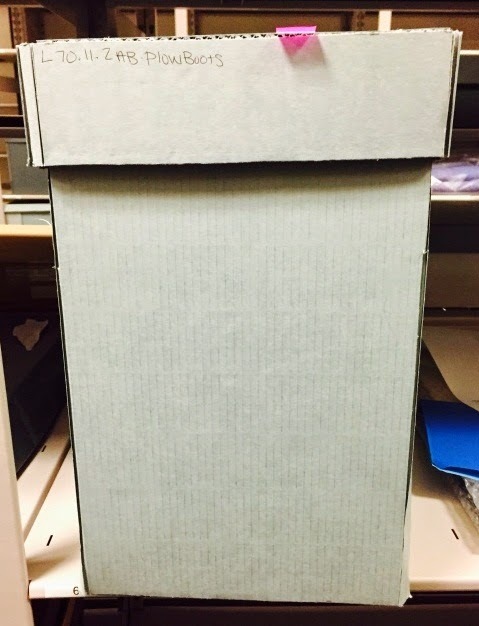 The ultimate challenge came when a few textiles, like the pair of tall plow boots boxed in the image below, would not fit into any of the boxes we had in stock. A tall and narrow box for Plow Boots. We made it so the front can open for easier access to the boots. Fortunately, we had a few large pieces of acid-free board that we could use to make additional boxes and a few trays. 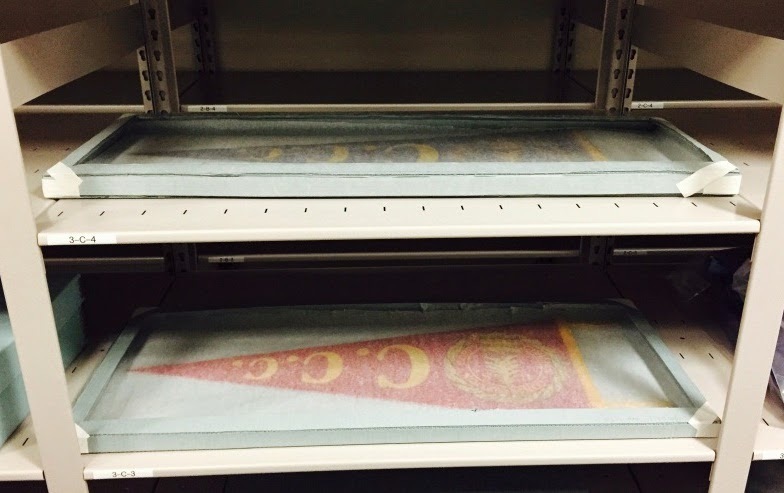 The trays were made for fragile items, like the felt pennants seen below, to provide the objects with extra support and protection. The benefit of making boxes and trays (aside from saving money) is that you can customize the box/tray to fit the object’s dimensions. Thus started what Lauren and I began affectionately calling "arts and crafts time." I must say, I learned something about myself during "arts and crafts"-- I would be the world’s worst engineer! It’s hard for me to build something from scratch without being able to physically see how the parts are going to come together. But after the careful application of the "measure twice, cut once" rule, the boxes and trays we made fit the objects and allowed us to move and store them in a functional manner. Making boxes and trays takes time, but I found it to be quite rewarding. If you are short on funds and have the time for some "arts and crafts," box-making is the way to go. If you aren’t sure of where to start, I highly suggest checking out STASH (Storage Techniques for Art, Science and History), a collaborative storage solutions website built by collections professionals that provides the user with methods of storage for all types of collections.